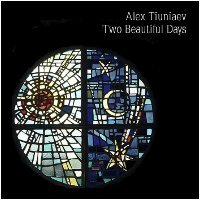 Two Beautiful Days is a new electronic ambient release from Moscow-based artist Alex Tiuniaev, the second release by Earth Mantra in the new year of 2009. And what a release it is! Pure textural ambience greets the listener, which is just as suitable for passive enjoyment as for active engagement. Alex is clearly as comfortable with sound sculpture as he is with the other myriad genres he calls home, crafting a supremely visual pair of tracks that are perfect for a cold winter's evening. The album consists of two moderately long ambient pieces, 25 December, 1990 and On a Cold Day. The former is dedicated to the peculiar Christmas day back in 1990 when Tim Berners-Lee implemented the first-ever communication between an HTTP client and server, thus inventing what we now call the World Wide Web. On a Cold Day, on the other hand, is a long journey through one cold winter day. Alex composed this piece when he lived in a small wooden house in a forest near Moscow. Both tracks are rich in detail and texture, showcasing Alex’s more experimental side as well as his sound design explorations. Having released a highly-acclaimed album on the famous Cold Spring Records label at the ripe old age of 22, Alex is currently working on many different projects, producing electronic and mood music, composing and arranging as well as collaborating with other electronic and rock musicians from around the globe. Earth Mantra is proud to release this intriguing and beautiful album and we hope that we will hear much more from Alex in this vein in the future.